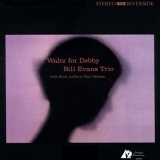 Waltz For Debby is ranked 2nd best out of 11 albums by Bill Evans Trio on BestEverAlbums.com. The best album by Bill Evans Trio is Sunday At The Village Vanguard which is ranked number 1897 in the list of all-time albums with a total rank score of 1,165. Related links: top tracks by Bill Evans Triotop tracks of the 1960s, top tracks of 1962. Showing latest 5 ratings for this album. | Show all 123 ratings for this album. I love hearing some of these seminal jazz records that sound like they were recorded in the back room of you favourite dive, 30 people there in a smoke filled room at 2am. All sipping a nice shot or two of something. Very intimate. Absolutely brilliant. A beautiful late night jazz album recorded at the village vanguard. It's a lovely record if you want to hear some jazz but without the saxes and trumpets. It truly is superb with the title track and, milestones, particularly nice. A great lights out LP.